EQ2Wire » Don’t Punt the Gnome… Tinkerfest Returns! Don’t Punt the Gnome… Tinkerfest Returns! The cogs are oiled and the steam is rolling out—it’s time for Tinkerfest celebrations! The event runs from 12:01am PT on July 21st through 11:59pm PT on August 3rd. This year features one new collection, new quest reward options for “We Can Rebuild”, as well as more merchant items, Tinkering recipes, and Master Tinkerer blueprints. Previous quests will make their return along with the Aether races in Butcherblock, Great Divide, Lavastorm, and Tenebrous Tangle. The new Tinkerfest Jump pack! Niami has posted pictures of the new recipe and merchant items over on EQ2 Traders. The Stormhold TLE server will have a special Tinkerfest themed merchant, a celebrating tinkerer—as well as Shiny Tinkerfest Cog spawns—in Freeport, Qeynos, and Steamfont. Too many alts? Get the Tinkerfest quest tracker! Print it out or copy it to your own Google Drive by going to the File menu and choosing “Make a copy…”. All quests require knowledge of the Gnomish language to obtain them. Collect purple shinies in Gnomeland Security HQ as well as either Freeport or Qeynos. Five of the collection items are from Steamfont while four are from the cities (either city; they both have the same). Use the remote detonator on 10 nearly Erratic Tinkerfest Clockworks. Speak to her when done. Return to Gnomeland Secuity and target a hidden clockwork at /way -596, 176, 933, then examine the admin key. This will zone you into an instance called Admin Level Access. Head east across the room, avoiding combat if possible. Invis/Stealth will work. Make your way up the southern ramp. Head to the central area on the northern side of the upper level. Speak to the Geargobbler System at /way 4, 15, -6. Go through all of its dialogue options for the update. Click the mound to enter the instance Klak’anon: Ulterior Mechanica. Speak to Redd then follow him. Once he stops, speak to him again. An Adventurous Fighter around /way -134, -24, 97 (near ramp in). Drops the King’s Cog. An Adventurous Wizard around /way -126, -22, 163 (south of fighter). Drops the King’s Pin. An Adventurous Coercer around /way -22, -4, 8 (NW-most path). Drops the King’s Speech. An Adventurous Bard around /way 3, -12, 107 (far west room). Drops the King’s Resistor. An Adventurous Scout around /way -56, -13, 204 (SW room). Drops the King’s Gear. An Adventurous Coercer around /way -183, -36, 4 (NE room). Drops the King’s Capacitor. Collect all the items in this collection by gathering purple shinies in the areas listed above. 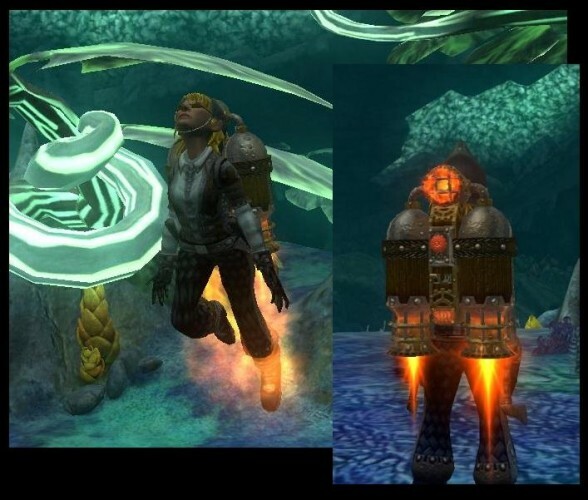 Can the jet pack be used as an appearance for flying mounts? If not, please make that happen! This is a great site, I have ended up here a few times since my return to EQ2. I get the essential information i need right off the bat, bookmarked!!! The traders site is pretty good too. I’m still punting the gnome. ALWAYS punt the gnome.